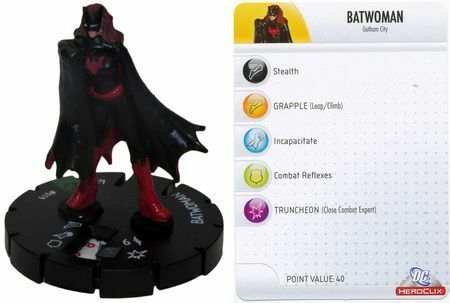 The figure used for this unit is a Heroclix figure from the Crisis set. Its model number and name are #019 / Batwoman. Character Bio - Once a soldier, always a soldier. The daughter of a respected United States Colonel, Kate Kane spent her entire life fighting, especially after the tragic loss of her mother and twin sister. After being kicked out of the United States Military Academy for refusing to lie about being a lesbian, Kate returned to Gotham City and lived somewhat aimlessly until a chance meeting with Batman. His dedication and the sight of the Batsignal inspired her. Using her training and stolen military technology, Kate became Batwoman. Despite the Armed Forces allowing her to return after the Don't Ask, Don't Tell policy was repealed, Kate decided to stay in Gotham. She had found a new fight in the war against crime and corruption. As a Human, Batwoman has these Human Synergies. As a Vigilante, Batwoman has these Vigilante Synergies. Last edited by Ronin; October 9th, 2017 at 12:30 AM. At the start of the game, after Order Markers are placed and before initiative is rolled, you may place up to two Utility Equipment Glyphs of different types on this card. 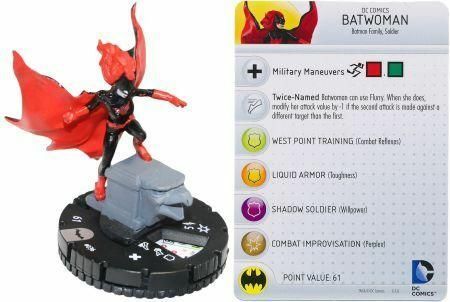 Batwoman can equip a Utility Equipment Glyph even if there are other Utility Equipment Glyphs on this card, up to a maximum of 2. Batwoman cannot lose these glyphs by receiving wounds unless she is destroyed. If Batwoman inflicts at least one wound on an adjacent figure with her normal attack, the defending figure receives one additional wound. If a non-adjacent figure targets Batwoman for an attack and rolls 2 or fewer skulls, you may ignore that attack. Last edited by TrollBrute; April 17th, 2017 at 07:53 PM. My next obligation for the Anniversary wave, a character I've wanted to do for a long time now, and an old Sidekick era write-up: Batwoman! which is much cheaper and easier to get a hold of. Thoughts on which one is better? As for the design itself. I have Utility Belt 2 here to spice up the design a little (had UB1 originally) and because Batwoman uses a ton of gadgets. Not quite Bruce level, but I think UB2 is fitting. I also considered designing a Utility Glyph for her, along the lines of a Flash Bang Grenade or Tear Gas for the military connection. Still brainstorming ideas this week, but open to any suggestions on that front. Also considered Stealth Dodge instead of Bulletproof Suit. I like the latter because she's less stealthy than Bruce, and often takes shots rather than dodges them. A simple reuse of Stealth Dodge is hard to argue against though. I've seen a few Flash bang ideas and I think that could be cool with her. Stealth Dodge vs Bulletproof suit...I like suit for the thematic part. I think I'm okay with Bulletproof Suit - everything else is reused and it helps sell the "rough and tough army background" along with Surgical Strike and it is mechanically distinct. Would definitely be interested in seeing a new Utility Glyph as well, ideally one that plays well with her "get in, hit hard, get out" playstyle. I actually prefer the second mini, since it's sans-dressing and is just the character. But am fine either way. Definitely like Utility Belt 2 and Surgical Strike here. Bulletproof Suit sounds more like an auto-shield power to me (something like 2 auto-shields against normal range? ), but I'd be fine with it as-is or switching to Stealth Dodge. I definitely think some new Utility Glyphs for her would be cool; even doing ones that worked better with "Disciplined Vigilantes" would be interesting. On the mini, I'd just wait and see what we can get pictures off. If no one can get us pics of the second one, then the first is a decent option too. I like the idea of Bulletproof Suit here, I just think it is a little too powerful to accurately reflect that right now. Lots of non-adj. normal attacks are more dangerous than bullets in C3G and even when it comes to bullets a bulletproof vest reacts much differently when hit by pistol ammo (Street Thugs) vs. assault rifle (Punisher) shots. The armor should still help somewhat vs shrapnel (Explosive-based SA) and buckshot (Shotgun SA). I'd go with one auto shield or maybe roll 3 additional def. die when faced with non-adj. attacks (all). Then it gives her some universal protection while not being better than what Iron Man's suit provides. Below was some discussions had for Flashbangs in the past. When this glyph is revealed, all figures on this glyph or adjacent to this Glyph subtracts 1 from its Move, Range, Attack, and Defense numbers to a minimum of 1 for the remainder of the round. Destructible objects are not affected by this special attack. If one of you want to run with this feel free. I have enough to keep me busy for a few years but I'd love to see this make it to the belt. That is pretty cool Japes. I think I would roll more dice though if you are looking for shields. 6 dice would give you 2 shields on average, so maybe 5 dice would give you between 1-3 shields more often then not, and that would be a nice effect. Yeah I came up with it when I was going through my love of Vertigo phase a year or so ago...I'm just in deep like currently. I think I owe that to Dysole...he brought me to the light so to speak. She's a fun unit with a lot of benefit for a low cost. 1-3 shields is good but the possibility of reducing someone's defense that much is major. Since the main purpose of the glyph would be to soften up targets before an attack and not an attack in itself I wouldn't want it to be too strong and I think averaging 2 shields would be high. It is single use, though, right? Then adjusting the power level up a tad makes sense. It has to be worth using that one time. How about this for Bulletproof Suit? If a non adjacent figure rolls fewer than 3 skulls when attacking Batwoman, you may ignore that attack. This would make her largely safe from street level figures at range, which seems thematic; high caliber weapons or a blast from Silver Surfer should not automatically be blocked. Not a huge fan of that, to be honest, but it's interesting. Still not worth attacking her from range unless you're rolling 6+ dice. I prefer the simpler version in the OP, but I wouldn't be totally against this suggestion if the majority prefers it. After moving, you may destroy this glyph and choose a space within 4 spaces of this figure. All figures on or within 1 space of the chosen space subtract 2 from their Move, Attack, and Defense until the next time you reveal an Order Marker. After moving and instead of attacking, you may destroy this glyph and choose a space within 4 spaces of this figure. Roll the 20-sided die for each figure on or within 1 space of the chosen space. If you roll 13 or higher, remove 1 unrevealed Order Marker from that figure's card. On the first version I would rather see the effects go away when the affected figure next reveals an OM on that card. Otherwise, use the flashbang and then just stop using that card except via bonding. I really like this idea! It falls right in line with her character (new or old) and captures a part of her that isn't that well represented here - her dad's use of military grade items in helping her become a vigilante. That power feels like cutting edge sci-fi military stuff.